The Canary Islands have had their own flag since the 10th of August 1982, established by the 10/1982 law. This is the civil flag of the Canary Islands. The state flag also includes the Coats of Arms of the Canary Islands. There is an actualized version from 2005 of the Manual of Graphical Corporate Identity where a colour construction sheet is given for the flag. Also, the manual states that the length of the coat of arms is 75% of the length of a vertical stripe. The previous version of the flag, before the 2005 change, included a more darker shade of blue, which can still be seen in many places in the Canaries. The coats of arms has the word “Oceano” written on top, above the representation of the Spanish Royal crown. Is is represented on an azure field, with the seven islands in silver, with two dogs, one on each side, as supporters. The presence of the two dogs in the coats of arms may derive from the translation of Insula Canaria, which in latin means Island of the Dogs. There has been some controversy in the past years regarding the collars on the dog’s necks, as this is a symbol of submission that should be removed. However, one of the political parties has not supported the idea to remove this symbol from the coats of arms, or the dogs in general, so the proposal to remove them has not passed. What is the meaning behind the colours of the Canary Islands flag? Although it is not officially states as an explanation, the three colors are said to derive from the maritime flags of Tenerife and Gran Canaria. The maritime flag of Tenerife is white and blue. The maritime flag of Gran Canaria is blue and yellow. 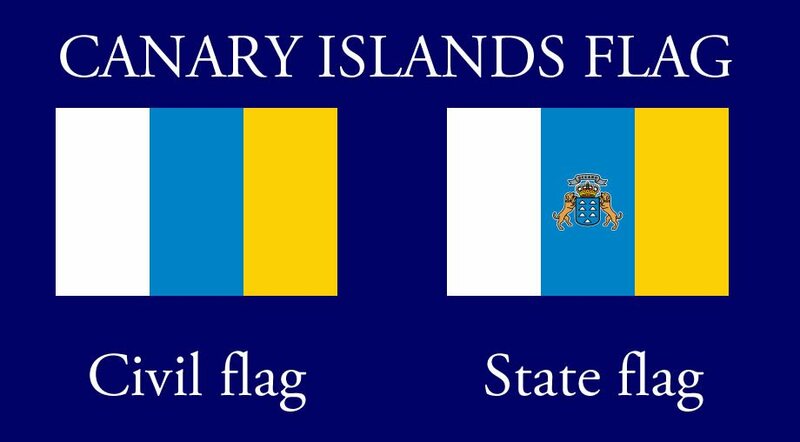 The two islands still continue to use each their corresponding maritime flag to this day. The placement of the colors is said to be derived from the actual physical location of the islands: white in the left, corresponding to Tenerife’s location in the west, the yellow on the right side, corresponding to Gran Canaria’s position in the east and blue in the middle, as the common color for both of them. The first flag was created in 1961 by the movement called Canarias Libre (The Free Canaries or the The Free Canary Islands), who came up with a flat uniting the colors of Tenerife and Gran Canaria. Back then the middle blue stripe was considerably larger compared to the white and yellow one. The design is attributed to Maria del Carmen Sarmiento, Jesus Cantero and Arturo Cantero. It was first used in Gran Canaria during the festivity of Virgen del Pino and it was rapidly accepted by the local people. The flag design used today is an adaptation of the first flag, modified to make the three stripes identical in size. Besides the flag of the Canary Islands, as an autonomous province of Spain, each island in the archipelago has its own flag, each one with a long and complex history behind it. Although the Canary Islands are not an independent state, but an independent community of Spain, their flag can be found in the emoticon list of the popular app Whatsapp, among other national flags. This details has sparked quite an enthusiasm among canarians, who were glad to see their flag in the list.